Metallica are a band known for not doing things half way, and when they set out to make a live album, they did it on an epic scale. 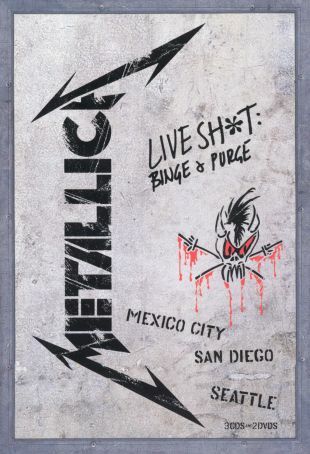 Metallica: Live Sh*t -- Binge and Purge is a mammoth box set which on features a complete three hour concert recorded in Mexico City 1993 on compact disc, and on home video adds two more shows in their entirety -- San Diego in 1992, and Seattle in 1989. If that wasn't enough, the package also comes with an extensive souvenir booklet, a Metallica stencil, a replica of a "snakepit pass" from the 1992-93 tour, and more. Eight and a half hours of Metallica at the peak of their form, Metallica: Live Sh*t -- Binge and Purge is the ultimate live set from one of America's most consistently innovative hard rock bands.